A pair of impressive albums had their debut on this day in 1975 and '78. Blood On The Tracks, widely considered one of Bob Dylan's best, and the breakout album Infinity from Journey. Dylan had started recording his 15th album in New York City in the fall.Unsatisfied with the sound of several of the songs, he delayed its release and went to a Minneapolis studio to re-record half the songs on it. 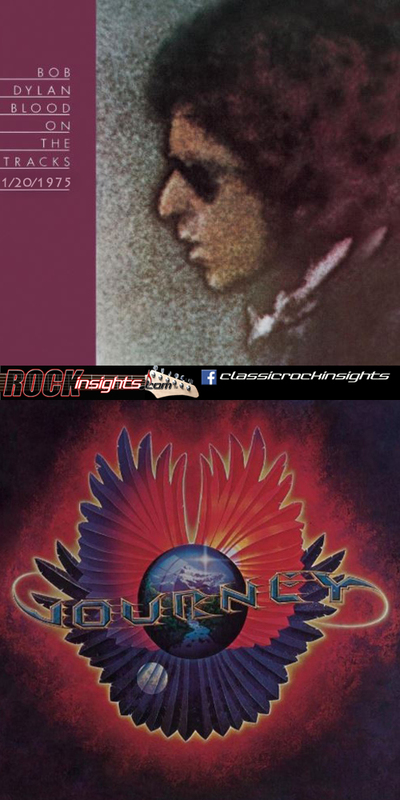 Journey's 1978 release on this date was the album that introduced Steve Perry. The group's three previous releases had established a fair sized fan base. Infinity, produced by Roy Thomas Baker, became one of the year's biggest albums in a year an amazing number of great lps came out. Meet The Beatles got its US release on this day in 1964. The Grateful Dead's Jerry Garcia released his self-titled sol debut on this day in 1972, and Jimmy Buffett shipped out Changes in Latitudes, Changes in Attitudes on 1/20/1977 and Def Leppard unleashed Pyromania on this date in 1983. Rockers born on January 20 include Eric Stewart of 10cc(1945)and Judas Priest's Ian Hill and Paul Stanley of KISS, both in 1952. And January 20th in 1982, Ozzy Osbourne chomped the head off a bat on stage at the Iowa Veterans Auditorium in Des Moines and spent the evening in the Broadlawns Medical Center after getting rabies shots.